← Who or what can we really care for? 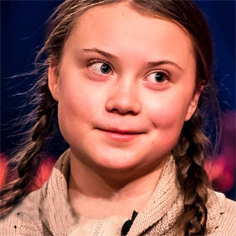 Greta Thunberg is a Swedish activist who–at the age of 15–gained global attention by starting the first school strike for climate outside the Swedish parliament building. She’s spoken at TEDxStockholm and the United Nations Climate Change Conference and continues to be a formidable champion for the planet and its creatures. In other words, she’s a superhero. In this video clip (click subtitles on bottom frame), Greta shares the formative experiences that made her a superhero. Her words below align with Rose’s teachings on how we can all be satisfyingly superb superheroes. If you need more support for the changes you’re going through, you can email me. See the Contact page for more info. This entry was posted in Contrary Self, Superheroes. Bookmark the permalink.